At the recent 'Mobile TV - hit or miss?' forum in London, representatives from the government, the mobile TV industry and technology experts banded together to find out why mobile TV is failing to set the world on fire?' forum in London, representatives from the government, the mobile TV industry and technology experts banded together to find out why mobile TV is failing to set the world on fire. There's obvious optimism about mobile TV in Europe. "Mobile TV is a great option for catching up on the latest news and your favourite TV shows when you're waiting at train stations and airport," said Christophe Forax, a spokesperson for the European Commission. But there's also an admission that mobile TV is still a niche offering and far from compelling for consumers. Don't expect a revolution just yet. Juniper Research suggests that "the UK is not expected to relaunch mobile broadcast TV services until 2010 at the very earliest, well behind most of its European neighbours." Nevertheless, Christophe Forax used the Mobile TV forum to say that he believes it isn't a case of "if mobile TV will take off in Europe, but when". Better, faster technologies are required and more on-demand content is needed to make it a significantly better experience. Bruce Renny, group marketing director of mobile TV provider ROK, agreed about the great potential for mobile TV. "With three billion handsets currently in use around the world, there are more mobile screens than every TV, computer and cinema screen put together." 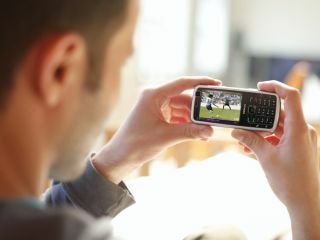 UK operators such as T-Mobile, Vodafone and Orange already offer their own mobile TV packages, a mix of streaming services and video downloads. The newest initiative, 24/7 Football, is a cross-operator subscription service (£5 per month) backed by Sky Sports, The Sun and the News of the World. These are baby steps and Renny acknowledges that it's still too expensive and complicated to tune into mobile TV. "People tend to watch TV on their mobiles for just a few minutes compared to hours on a standard TV screen. People don't want to pay to see just a few minutes worth of clips but if broadcast is free as part of a bundle, they will adapt to it." The business model so far in the UK is wrong, said Hyacinth Nwana, managing director of mobile media solutions at broadcast firm Arqiva. Mobile TV offerings in the UK are dominated by subscription services and pay-as-you-watch downloads. That needs to change. "In South Korea, where mobile TV has been very successful, most of the programming is free-to-air broadcasts. Why would you pay for that?" Nwana asked. "If you're on the train home and you can watch EastEnders free on your home TV when you get home, then why would you pay to watch it [on your mobile]?" People are only prepared for services if they can see a value in them, agreed Barry Flynn, principal consultant at TV technology consultancy Farncombe Technology. "People spend on average around £200 per year on their mobile phone. That includes the subscription cost, voice calls, SMS text messages, data usage etc. Last on the scale comes mobile TV." The problem, according to Flynn, is that whereas people value all the other functions provided by their mobile phones, they currently see no value in mobile TV. "Even among the people who are aware of mobile TV the uptake is very low," he said.